SAN JOSE, CA--(Marketwired - Apr 21, 2015) - To thrive in today's fast-paced digital age, organizations need real-time access to knowledge, collaboration and a continuous learning environment both inside and outside of the organization to deliver rapid innovation. 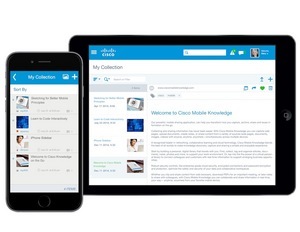 Today, Cisco (NASDAQ: CSCO) is introducing Cisco® Collaborative Knowledge, a Software-as-a-Service (SaaS) solution designed to help our customers transform their organizations and empower any employee with the digital tools and technology they need to access experts, learning and knowledge in real time. In today's evolving marketplace, organizations must develop innovative ways to train and update the skills in their workforce and share expertise both internally and with their customers. One of the greatest challenges facing organizations today is not only a shortage of people -- it is also a shortage of key skills. With 90 percent of jobs expected to change in the digital economy1, analysts predict there will be an estimated shortage of 38 to 40 million college-educated workers by 20202. To be positioned for growth, performance and productivity, organizations must transform into digital workplaces where knowledge sharing, learning and talent innovation are able to occur in real-time, anytime, anywhere. Cisco Collaborative Knowledge integrates best-in-class consumer and business technologies to enable capabilities such as highly secure knowledge sharing, expert identification, continuous learning, social networking and analytics into one complete and end-to-end enterprise knowledge exchange. 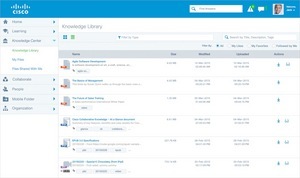 With Cisco Collaborative Knowledge, workers are able to benefit from these continuous learning features, helping organizations innovate and solve real-world business challenges. Mobilize their workforce with knowledge, speed and flexibility to create a more agile, engaged and productive organization. 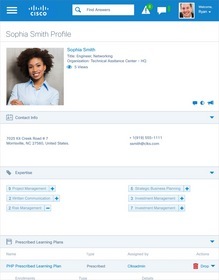 For example, with Cisco Collaborative Knowledge, a mobile sales professional who is engaging with a new prospect can quickly access learning modules that provide the information they need about a particular product, solution, or market right as they need it. Through knowledge that is available and sharable via a mobile platform, everyone has quick access to valuable resources to shape the way they work, learn, collaborate and innovate together. Fast-track learning and knowledge sharing to foster a culture of continuous learning and innovation. By integrating formal and informal learning resources, organizations can effectively reskill their workforces, or specific departments, by providing job-specific knowledge and training through a comprehensive platform. For example, in an initial pilot, the Cisco® Services organization reskilled 14,000 employees in just over a year to help transform Services into a consultative and outcomes-based solutions selling organization. Tap into the collective knowledge of the entire organization to innovate and transform the customer and employee experience. 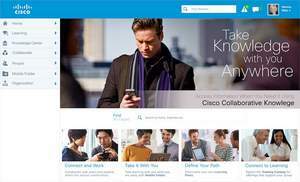 With Cisco Collaborative Knowledge, employees have instant access to experts, enterprise wide repositories of collective knowledge and social learning, and collaboration tools that enable them to innovate in the moment to improve the customer and employee experience. 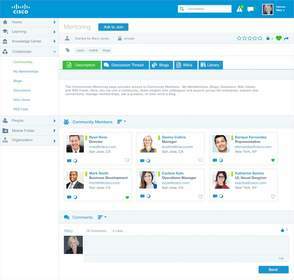 Embracing proven Cisco collaboration technology, Cisco Collaborative Knowledge complements organizations' existing in-house content management systems, social enterprise communities, learning investments and HR systems. Jeanne Beliveau-Dunn, vice president and general manager, Cisco: "In today's fast-paced digital workforce, knowledge, speed and flexibility are key for any organization to succeed. Teams that are empowered digitally with access to experts, learning and knowledge in real-time are better equipped to solve business challenges anytime, anywhere. Building on a tradition of leadership in education, collaboration and highly secure solutions for enterprises, along with our practitioners' expertise in producing great outcomes for our own company, we are proud to introduce the tools and knowledge services our customers need to reinvent talent." Ellis Rubinstein, president and chief executive officer, New York Academy of Sciences: "The majority of tomorrow's jobs will require science, technology, engineering and math (STEM) skills. Unfortunately, many of today's students are not attaining the STEM skills necessary to be successful in the workforce. To tackle this challenge, we created the Global STEM Alliance (GSA) of the New York Academy of Sciences, designed to accelerate skill development and STEM engagement through a combination of mentorship, peer-to-peer support and online curricula. As a founding member of the GSA, Cisco is lending its expertise in technology to create the virtual platform necessary to enable real-time collaboration and knowledge sharing between students and STEM experts around the world. The opportunity to inspire the STEM innovators of tomorrow, regardless of location or device, is one of the most thrilling elements of working with Cisco." Michael Carter, vice president of Human Resources, Cisco: "Emerging technology and the changing needs of the workforce are driving the need for HR to deploy solutions at the edge of the organization. Only by deploying the right HR infrastructure at the edge will businesses be able to develop a workforce with the agility required to meet the needs of their customers, and at the same time engage the talent in a way that empowers them to define, grow and re-define their careers. Cisco Collaborative Knowledge grew out of an in-house pilot that was created to connect the evolving needs of the business with the skills and capabilities in the workforce in a way that made the business strategy relevant to how employees want to come together to connect, develop and transform." Cushing Anderson, program vice president for project-based services research, IDC: "Talent agility is essential to success. Organizations need to be able to quickly get everyone performing at a high level by adding new skills and sharing institutional knowledge. A collaborative knowledge solution can transcend the constraints of time and place by harnessing the collective intelligence of the workforce to achieve both individual and organizational success."